If you’re a non-profit interested in conducting an organizational assessment, the nuts and bolts are well-covered at Reflect & Learn, a hub for organizational assessment resources developed by Universalia Management Group and the International Development Research Center (IDRC). The website provides a comprehensive database of frameworks and tools that can be used for organizational assessment. 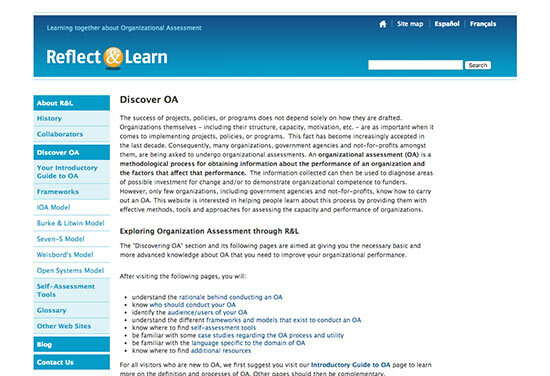 These are illustrated through a number of examples of OA experiences. The site also offers and facilitates a discussion area where individuals and organizations with an interest in organizational assessment, change management, learning, and capacity development can exchange their experiences and ask their questions. Very cool one-stop-shop!